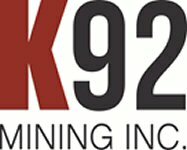 VANCOUVER, BRITISH COLUMBIA--(Marketwired - July 15, 2016) - K92 Mining Inc. (the "Company" or "K92") (TSX VENTURE:KNT) is pleased to announce an increase of its previously announced non-brokered private placement (see news disseminated on July 7, 2016) from $5,000,000 to up to $12,500,000 (the "Financing") through the issuance of up to 12,500,000 units (the "Units") of the Company at a price of $1.00 per Unit, up from the 5,000,000 Units previously announced on July 7, 2016. Each Unit will consist of one Common share (an "Offered Share") and one half of one Common share purchase warrant (a "Warrant"). Each full Warrant will allow the holder to purchase one Common share of K92 at a price of $1.50 for a period of 12 months from the date of issuance, subject to the acceleration right described below. Proceeds of the Financing are intended to be used for general corporate purposes and to give the company enhanced optionality when completing the underground incline drive from Irumafimpa to Kora, with drill testing along the way. K92 may engage certain finders (each, a "Finder") to assist in locating investors for the Financing and intends to pay each Finder a fee equal to 7% of the gross proceeds received from investors identified by the Finder, payable in cash and/or Offered Shares, and issue Warrants to purchase Offered Shares equal to 7% of the aggregate number of Offered Shares purchased by investors identified by the Finder. The Finder's Warrants will be on the same terms and conditions as all other Warrants issued under the Financing, including the acceleration right described below. The Financing is intended to be completed during July, 2016 and is subject to certain conditions, including the approval of the TSX Venture Exchange (the "TSXV"). All securities issued as part of the Financing will be subject to a hold period of 4 months and one day from the closing date of the Financing. If the Common shares of the Company trade on the TSXV at a price of $2.00 or greater for any period of at least 10 consecutive trading days, then the Company may accelerate the expiry date of the Warrants to the 30th day following the date on which the Company provides notice to the holder of such acceleration in accordance with the terms of the Warrants. Any Warrants not exercised on or before such 30th day will expire and will no longer be exercisable. The TSXV has in no way passed upon the merits of the proposed Financing and has neither approved nor disapproved the contents of this press release. CAUTIONARY STATEMENT REGARDING FORWARD-LOOKING INFORMATION: This news release includes certain "forward-looking statements" under applicable Canadian securities legislation. Forward-looking statements are necessarily based upon a number of estimates and assumptions that, while considered reasonable, are subject to known and unknown risks, uncertainties, and other factors which may cause the actual results and future events to differ materially from those expressed or implied by such forward-looking statements. All statements that address future plans, activities, events or developments that the Company believes, expects or anticipates will or may occur are forward-looking information, including statements regarding completion of the Financing and the expected use of proceeds. Forward-looking statements and information contained herein are based on certain factors and assumptions regarding, among other things, the market price of the Company's securities, metal prices, taxation, the estimation, timing and amount of future exploration and development, capital and operating costs, the availability of financing, the receipt of regulatory approvals, environmental risks, title disputes, failure of plant, equipment or processes to operate as anticipated, accidents, labour disputes, claims and limitations on insurance coverage and other risks of the mining industry, changes in national and local government regulation of mining operations, and regulations and other matters.. There can be no assurance that such statements will prove to be accurate, as actual results and future events could differ materially from those anticipated in such statements. Accordingly, readers should not place undue reliance on forward-looking statements. The Company disclaims any intention or obligation to update or revise any forward-looking statements, whether as a result of new information, future events or otherwise, except as required by law. About this company K92 Mining Inc.